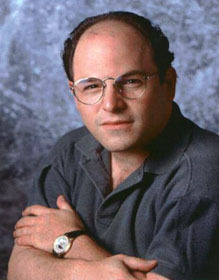 From 1990 to 1998, Jason Alexander played the balding, chronic liar George Costanza on Seinfeld. In Costanza style, he was Emmy-nominated every year from 1992-98, and lost all seven times. Since Seinfeld, Alexander starred in Bob Patterson, a short-lived sitcom about a neurotic shrink, and Listen Up, where he plays a sports show host based on real-life sportswriter Tony Kornheiser. In Ultimate Trek: Star Trek's Greatest Moments, a bizarrely awful 1999 'special' on UPN, Alexander played William Shatner playing Captain James Kirk. Part spoof, part tribute, part clip show from the original and subsequent series, Alexander said he did it as a labor of love, as a long-time fan of Star Trek. He later mocked his post-Seinfeld career slump in an episode of Larry David's Curb Your Enthusiasm. Alexander served as the commercial pitchman for Kentucky Fried Chicken (KFC) from 2001-03, and sales went up. Speculation ran that Alexander was canned after meeting with activists from People for the Ethical Treatment of Animals (PETA).